Why do Many Patients Fear Going to the Dentist? 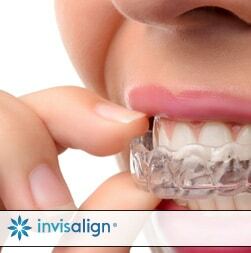 What is Air Abrasion and how does it make going to the Dentist more Comfortable? Many dental patients are unaware that in many cases, certain cavities can be easily removed and filled without the need for shots or the dental drill. Fissure decay and smaller cavities at the gumline for example can be quickly and comfortably removed with air abrasion and then filled with a white filling without the patient needing to be numb with a shot. We do this procedure daily for our patients in my Victoria, TX dentist office. 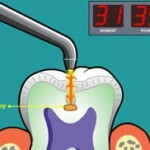 So why have most dental patients out there never heard of this air abrasion procedure? Air abrasion drill less fillings are not taught in dental school. A dentist who wants to offer this procedure in their dentist office would need to have specific training in tooth anatomy and air abrasion technique. Air abrasion requires high magnification loupes and excellent lighting for the dentist since the intricate procedure is typically performed on an extremely fine scale that only removes the minimal amount of decay and conserves the healthy tooth structure. In my professional opinion, diagnodent laser decay detection is essential to use in conjunction with air abrasion. 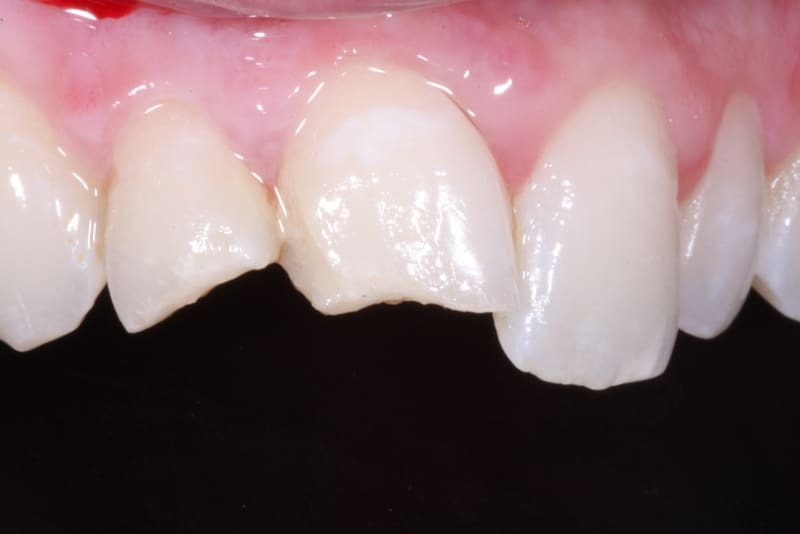 This allows the detection of decay as early as possible before it is visible on xrays, thereby allowing the most conservative and comfortable decay removal. What is the Air Abrasion cavity removal process like? In the photos above you can see the typical sequence of cavity detection, air abrasion removal, and then composite restoration. 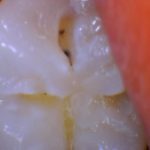 Are you a candidate for air abrasion fillings? 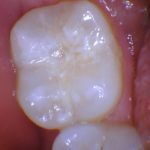 A thorough dental examination that includes laser cavity detection and high magnification is the only way that decay can be accurately detected before conventional dentistry typically finds it. Traditionally taught dentistry, the way I was taught in dental school, trains us to look for decay on xrays or by using the little hooked dental probe in the grooves during an examination. Those methods usually will detect decay only at a stage that is much further advanced or much larger which will have to be numbed up because it will be painful to remove. In contrast, the laser cavity detector will detect the decay much earlier on before it has had time to destroy a larger amount of tooth structure. 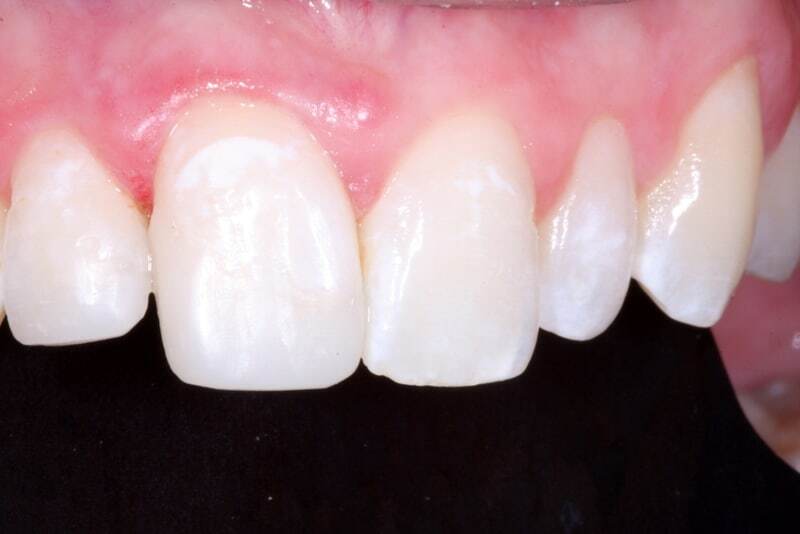 You can see in the photos above, even at this stage the decay can extend down into the inner layer of the tooth. If I still practiced the way that dental school taught me, I would have assumed that the dark color visible in the grooves was just stain. As we all know now, that was decay which was removed without a numb lip and with minimally invasive technique. That is what I would want for my tooth.